My Kitchen Adventures | Veggie-related food, recipes, articles. In this 4th post for the Winter Warmers Series, I wanted to share with you two recipes close to my heart. It’s actually the food that I crave when I return home after a long holiday or time away from home. You can’t beat the comfort that comes with this meal and the flavour and texture combination of these together are just divine! So the first is for ‘Puttu’ or ‘Pittu’. 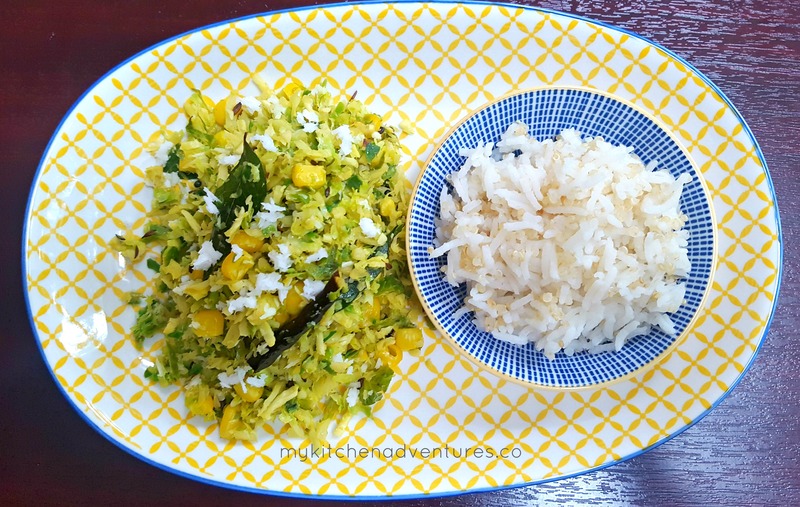 This is a healthy but really delicious main dish made with steamed rice flour and is found very commonly in Sri Lanka and Kerala. It’s usually the centre of the meal around which sits various other accompanying dishes and the Puttu soaks up all the flavours from each and is filling too! The second recipe is for ‘Kuzhambu’ or ‘Kulambu’. This is accompanying dish to the Puttu and is made with a tamarind gravy into which sits sauteed vegetables. My favourite type of Kuzhambu to go with Puttu is ‘Kathrikkai’ (Aubergine) Kuzhambu as the aubergine just melts in the mouth and this vegetable absorbs the tamarind and spices so well to give this amazing aroma….yummm! 1. Mix all the ingredients in a large bowl and make into a loose dough (but you don’t have to knead it like bread). Then, flour your hands and then roll the dough between your fingers so the dough looks like large breadcrumbs. 1. Put the ingredients into a food processor and pulse, adding the water a little at a time to get the same consistency. If either method makes the dough too wet then you can just mix in a little rice flour. 2. Mix in the coconut and then place in a steamer. I usually cover the bottom of my steamer with a thin & damp cloth/muslin. The cloth must be big enough to then wrap up the Puttu mixture. You don’t need to tie the ends of the cloth, just place it over the mixture. 3. Steam until the Puttu is cooked fully, approximately 10 – 15 minutes (the aroma will be so nice and you will start to smell the fragrance of the coconut too! ), and serve with a delicious curry like Kathrikkai Kuzhambu (see recipe below) or Soya Chunks & Beans curry. Aubergine is called “Kathrikkai” in Tamil and is a great vegetable to use in this kind of tamarind gravy or “Kuzhambu” as we call it. It is a comforting dish served with hot steamed Pittu or Rice. Chickpeas are not traditionally added but I think they compliment the Aubergine and provides a good portion of protein. The Aubergine is also traditionally deep fried, which obviously tastes yummy, but not healthy. So roasting the aubergine is a great way of still keeping the flavour and texture without a great amount of oil. The only thing with roasting is that you need a little more time, but it will be worth it in the end, I promise you! This dish tastes great the day after cooking it, as it gives the aubergine time to soak in all the flavours. This is one time when I think Srilankan curry powder is a must and I, personally, think it really doesn’t taste the same with other masala’s. 1. Cut the Aubergine into strips of about 1 inch in width and about 3 inches in length. Be careful not to cut the aubergine smaller than this as they may burn. At this point you can place the aubergine in a microwaveable dish and heat in the microwave for about 3 minutes. This is so they won’t absorb too much oil in the oven. 2. Add the salt and enough oil so all the aubergine is coated well. Place in the oven at 220 degrees Celsius for about 30 minutes, turning them over half way through and adding a little more oil if they look too dry. You may need to adjust the timing of this according to your oven and you need to keep an eye on them so they don’t burn too much. 3. In a separate pan, heat 2 tablespoon of oil. Add mustard seeds and when it splutters add the green chillies, fenugreek seeds and curry leaves. Add the sliced garlic and sauté for about a minute. Then add the diced onions and cook for about 5 minutes until the onions are translucent and cooked through. They may turn brown at the sides but that’s ok – it adds to the taste! 5. Cook for another 5 minutes and serve with hot Pittu or rice. This is my own take on a traditional British comfort food. It’s a great “1 pot dish” which we love having in our household at any time, but especially during those cold Autumnal and Winter nights. I have replaced the traditional meat with soya mince but you can also red or green lentils too. I love how some of the mixture oozes out of the dish at the sides during baking, creating a real homemade look to the dish and it’s great to see those smiles when it’s brought to the table 🙂 Foe me, this is a classic recipe that evokes comfort, warmth and feels just like you have been given a huge hug 🙂 I also think if you are NOT a vegetarian, and you have vegans or vegetarians coming over during Christmas, then I bet you they will love you for making this! A great dish that can be made vegan and gluten free! 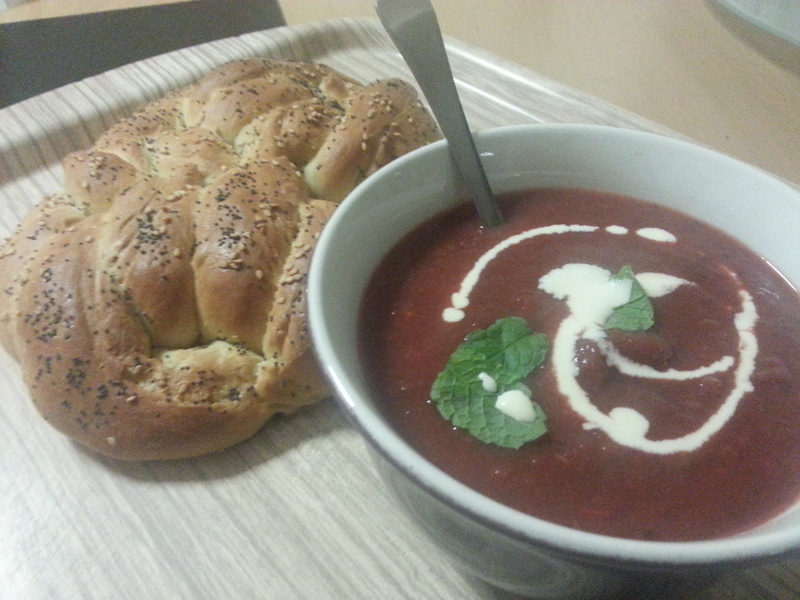 For the other recipes in this Winter Warmers Recipe Series: Borscht (soup), Apple Spice Muffins. Preheat the oven to 180C & boil the potatoes until tender. Drain and set aside. Meanwhile heat the oil in a saucepan, add the onion, garlic and the carrot and fry gently until softened. Add the mince, veg, tomatoes, tomato puree, soy sauce and seasoning. Simmer for about 5 – 10 minutes and then add the cornflour made into a paste with the tablespoon of cold water and continue to simmer gently, stirring all the time, until thickened. Add the herbs and then transfer the mixture into an ovenproof dish. Bake for 20 minutes or until the topping is crisp. Leave to rest in the dish for about 5 mins before serving.Serve with some gravy (you can get the veggie kind in most supermarkets) and fresh salad. For the weeks coming up to the New Year, I hope to share with you some great recipes from around the world to help warm you up during these colder seasons. 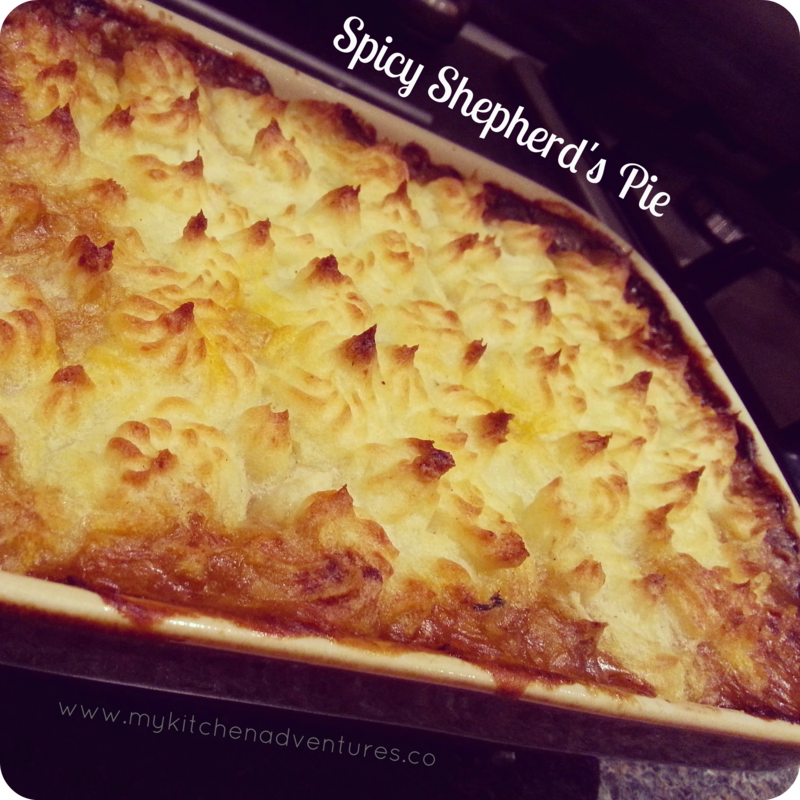 They are just simple but highly comforting things we all love to eat to help get through those chilly days and evenings. You can make this as a starter with some warm bread rolls or as a main meal if you just want something light but fulfilling. This soup is traditionally served on Polish Christmas Eve, but is perfect on any cold day as a great comfort food with your favourite bread. The sprig of dill I feel is quite important in this soup and gives it a distinct flavour. Stir in cumin seeds and cook for a further 1 minute and then add the remaining stock, bay leaf, salt & pepper. 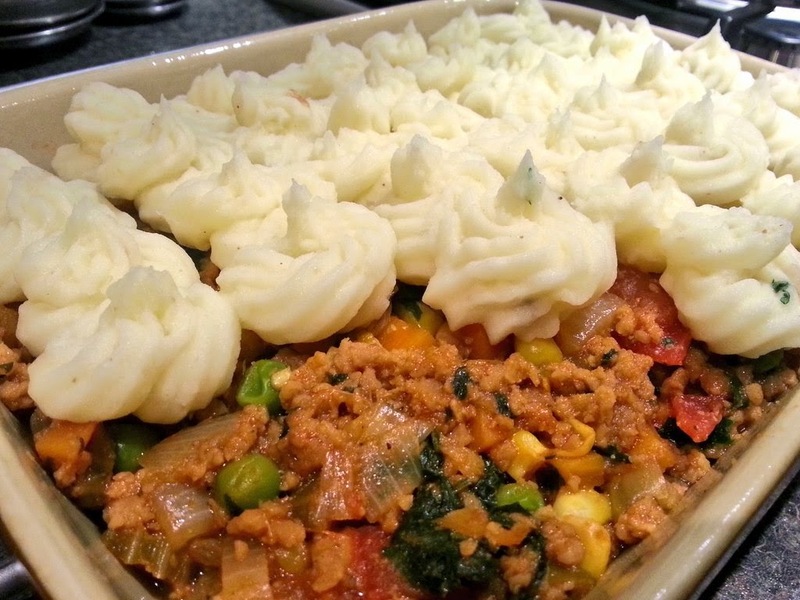 Using a handblender/food processor, take out about 3/4 of the veg with a slotted spoon and whizz until pureed. Return the pureed veg back to the pan, check for seasoning and then add the lemon juice. Serve with a garnish of dill sprigs and a swirl of sour cream. This is perfect with a chunk of your favourite bread or some freshly boiled/steamed potatoes. 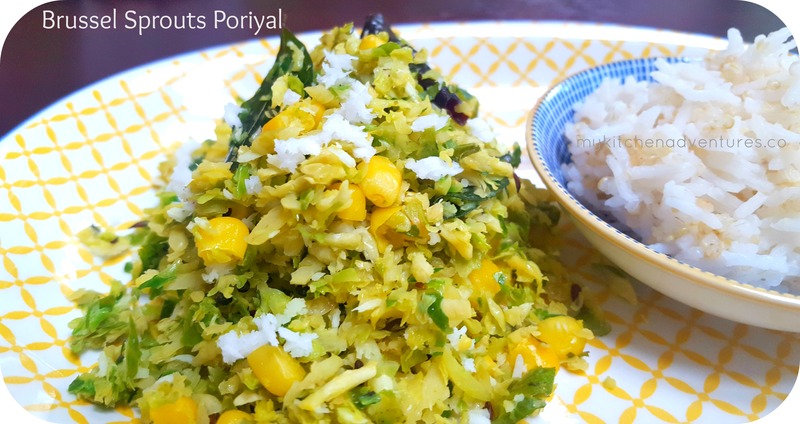 This is my favourite way of using Brussel Sprouts and using South Indian spices to make a light stir fry, or Poriyal as called in Tamil Nadu. It’s visually pleasing when you pair the Brussels with bright yellow Sweetcorn and garnished with coconut. I love the way this curry is not too fiery as it uses gentle spices and so if you don’t like hot curries all the time, then this is perfect for you! You can leave out the dried red chillies completely if you are serving it to children. A non-stick or ceramic pan is best for making this ‘Poriyal’ so the Brussels don’t stick to the bottom and burn. If you are in a rush you can steam the chopped Brussel Sprouts in the microwave with a tablespoon of water. This will reduce the time needed for them to cook in the pan. Heat the oil in a large saucepan and add the black mustard seeds. As soon as they start popping add the other ingredients under the ‘To Temper’ list above. When you send someone something, why get them to wait for a parcel or bother getting it from the Post Office if they’ve missed the delivery? Well Decadence Delivered have a fab solution to sending DELICIOUS COOKIES which fit through a letterbox without the hassles or sending a parcel! I was very lucky to receive a sample of these cookies by Decadence Delivered and it was such a lovely surprise when I found them waiting for me at home from the Postman. No waiting around at home for a delivery….no delays… no annoying notice from the Post Office saying I had missed the delivery…. and no driving to the Posts office to collect it! The box is very elegant and simple and I could feel there was something very special inside. And I wasn’t disappointed 🙂 Inside were a set of beautifully made cookies each individually wrapped and the inside cover of the box indicates which flavour you have received. It’s great packaging as it ensures the cookies are not damaged en route and presented very elegantly on opening. In addition to the choice of cookie, you can also personalise it if you are sending them as a gift, for whatever occasion. I imagine these would be perfect gifts for this Christmas! And there is 20% off your current order, so there’s a good deal to be had. Whether you want to get these cookies for yourself or for friends and family, these delectable cookies will surely bring a huge smile to whoever gets to eat them! On damp and dreary days, you can’t beat the comfort of some delicious Samosa’s and Chai! Here’s my way of getting that yummy taste of spiced potatoes and peas encrusted in a delicious buttery, crumbly pastry – without deep frying. I hope you give these a try and do let me know if you try any different fillings. These would be great with alternative fillings like paneer, chickpeas or cauliflower. Enjoy! 1.Peel the potatoes, cut them into small cubes and cook in a saucepan of boiling water. Take care not to overcook them as otherwise they will be too mushy when filling the Samosa’s. They need to be a little firm or ‘al dente’ in texture’ after cooking. 2. In a large frying pan heat some oil then add the cumin seeds. As soon as they start to splutter add chopped ginger and saute for few seconds. 3. Lightly mash the potatoes with your hand and add to the pan and then add all the other spices. Mix well so the spices and potatoes are combined. 4. Add the peas and cook the filling mixture for a further 2 – 3 minutes and then keep the mixture aside. 5.Make the pastry by combining both flours and salt into a large bowl. Then add the cubed butter and use your fingers to rub the butter into the flour so the whole mixture eventually looks like breadcrumbs. 6. In a small saucepan add the water, salt and the lard and gently heat until the lard is dissolved. Then pour all the liquid into the flour&butter mixture and use a wooden spoon to combine the wet and dry ingredients into a dough. 7. Place the dough onto a lightly floured surface and knead gently using your hands for about 3 minutes. It does not have to be well kneaded like if you were making bread, it’s just so that it’s all well combined. 8. Roll out a portion of the dough in oval shape. Now cut it horizontally using a knife, diving into 2 equal portions. Lightly dampen the edges of the rolled out dough with water and make cone. 10. Once you have repeated this to finish all the dough and filling, place in the oven for about 25 – 30 minutes or until the samosa’s are browned. Keep an eye on them as not all ovens are the same and you may have to adjust the cooking time accordingly. Serve these with a refreshing coriander chutney, or a tangy tamarind chutney – or both. And don’t forget your coffee of chai with this! YUMMMM! Well what a fab episode about all things sweet! I really enjoyed watching all the different roulades and Andrew, Selasi and Jane did particularly well on these. I think my favourite flavour Roulade was Andrew’s tropical holiday Roulade as it’s the kind of flavours I would enjoy 🙂 It was the first time I had heard of a ‘Marjolaine’ and these were a toughie for the technical challenge. Precision and the chewiness of the meringue layer were criticised and Andrew’s bake was the obvious first place. The final showstopper challenge was interesting and all the bakers struggled to get their mousse cakes set on time. There was some great flavour combinations but I think my favourite was Selasi’s lemon, raspberry and passion fruit one – the one that saved his place I think! I got thinking after watching the mousse showstopper round and about the kind of desserts I have made which involved setting agents (as I don’t use eggs or gelatin in my baking). So the obvious one for me was Panna Cotta 🙂 It took a while for me to try out this delicious Italian dessert the first time, as it always involved using revolting Gelatin. So it was very exciting when my lovely friend Kavitha told me about a yummy version of Panna cotta which was gelatin free! I tried this at her house and was really amazed by the texture and yummy flavour and it was great to know that you can make this without using Gelatin, phew! NOTE: Be careful not too cool the mixture too much in your pan as your setting agent (Vege gel or Agar Agar) may start to set the mixture. If you see your mixture starting to set in your pan then pour into the moulds/ramekins immediately. If you have a sweet tooth then you could add melted white chocolate for a more decadent flavour, but reduce the sugar to 25g. Today, Sunday 16th October 2016, is World Food Day. Why does this matter? Well one of the biggest issues related to climate change is food security. One of the world’s poorest populations are farmers and other primary food producers, who are being hit hardest by higher temperatures and an increasing frequency in weather-related disasters. So to address this issue as well as the ever increasing world population, a more sustainable way of producing food is now an urgent issue. This is a worldwide problem, not just for poor countries. The global message for World Food Day 2016 is “Climate is changing. Food and agriculture must too.” 2016 has been declared the International Year of Pulses (beans, peas, chickpeas & lentils) by the United Nations and so I was very fortunate recently to have been invited to the Cookhouse in Borough Market where other bloggers and I were treated to a fabulous demonstration about Pulses by Jenny Chandler. The venue was perfect for this event with a lovely view of the Market and a great demonstration platform where you could clearly view every step of the demo. Jenny is such a lovely person and she exudes her passion for pulses and food in general when you meet her. She started off by explaining how pulses are such an obvious answer to some of our food problems in this country and abroad as well as her work with the UN to promote pulses as a sustainable food. The ‘Pulses’ organisation does huge amounts of work to encourage farmers in this country and around the world to grow more pulses and create a more sustainable environment for people. Do check out out their website for more information on Pulses, recipes and how the countries are collaborating to help climate change and food security. Did you know peanuts are classed as a pulse? It was nice to see how a simple meal of Quesadilla’s could be made using homemade re-fried beans and then adding this to a flour tortilla with spring onions, chopped coriander leaves, jalepeno peppers. The thing I am going to try out when I make these is adding Wendsleydale cheese as Jenny explained how it’s not always easy to get Mexican cheese and so Wendsleydale comes close to that kind of texture. Yum! Jenny made some flavour packed Falafel, not using the usual chick peas, but delicious Fava Beans. Fava Beans are also known as Broad beans or Pigeon beans and I was surprised to learn that the UK is a big exporter of this humble pulse. I thought the use of Fave beans in Falafel made them taste less heavy and went so well with the parsley, garlic and cumin they were blended with. I really liked the way Jenny served the Falafel in Gem lettuce leaves which means that there’s no heavy pitta bread so I felt that I was getting the most out of the Falafel’s nutrients and it can become such a light meal – a genius idea! The health benefits of grains and pulses are so important and Jenny has also highlighted these as well as amazing recipes in her book ‘Pulses‘.